SN 146314 - This is a two owner boat, freshwater only and extremely well taken care of. The first owner purchased the boat from Marine Max brand new, owned it for 17 years and stored in heated storage since new. The second owner then purchased the boat 3 years ago and was as meticulous as the first owner.The distinctive Sea Ray 500 Sundancer mid-cabin combines impeccable lines, luxurious comfort, and unconditional seaworthiness. The 500 Sundancer is designed for serious cruising in uncompromised comfort. At the helm station, an adjustable captain's chair faces a wrap-around instrument console. Adjacent to the swivel helm seat is a large padded bench. The large, open cockpit provides a wet bar for refreshments, comfortable wraparound seating for eight, and a custom-engineered digital cassette stereo system with four speakers and cockpit remote control. Down four steps, the salon features a plush circular sofa with a convertible cocktail table - ottoman which can be raised to form a convenient dining table. An advanced stereo system, featuring cassette and compact disc, is acoustically matched to the interior to provide custom-equalized sound. A custom-built breakfast counter with padded bar stools separates the salon from a fully appointed walk-in galley with refrigerator - freezer, three-burner cooktop, and microwave. Portside, across from the galley, the guest stateroom includes a double bed with upper berth, cedar hanging locker, and full head with vanity and shower. Forward, a comfortable settee and a queen-size bed with custom designed sheets and bedspread grace the master stateroom. Cedar-lined hanging lockers with mirrored doors and a large mirrored dresser are included. The en-suite master head has a ceramic tile floor, VacuFlush head, vanity, and shower with a built-in seat. 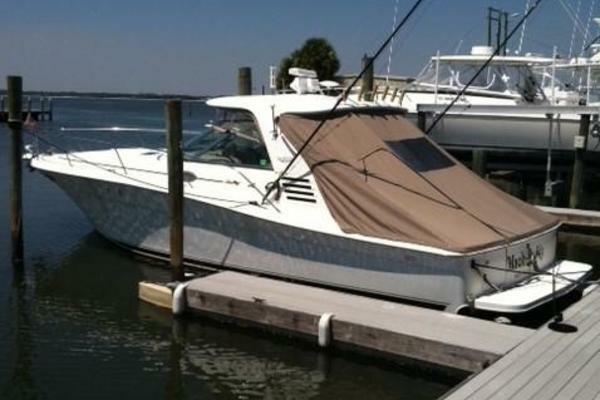 United Yacht Sales New Jersey would love to guide you through a personal showing of this 50' Sea Ray 500 Sundancer 1998. This yacht for sale is located in Port Clinton, Ohio and priced at $179,900. For a showing please contact us by filling out the form on this page and we will get back to you shortly!